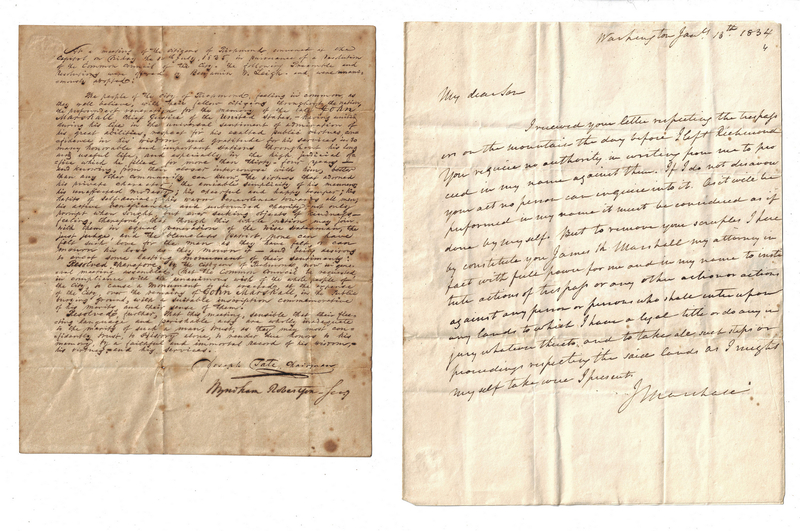 Two (2) John Marshall related letters. 1st item: Handwritten letter from John Marshall (1755-1835), 4th Chief Justice of the United States. ALS. 1pg. 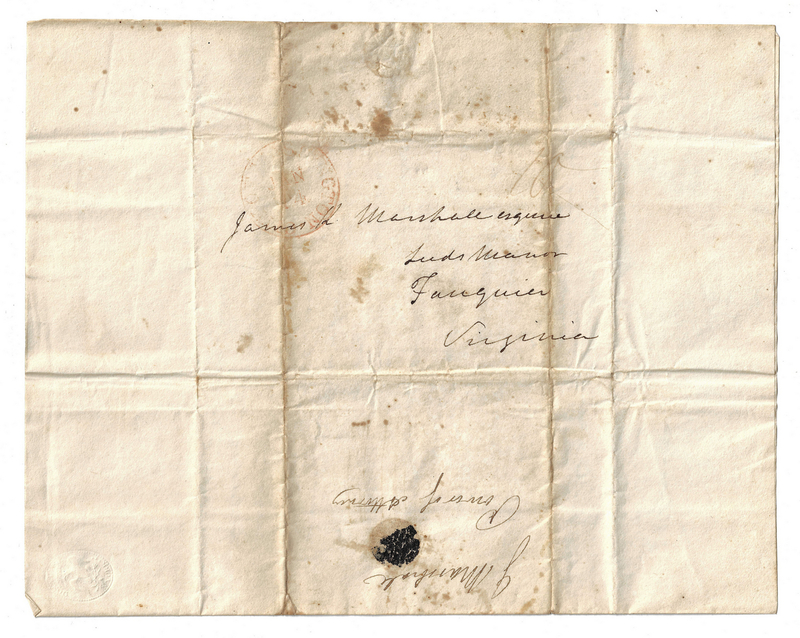 January 13, 1834. Washington. 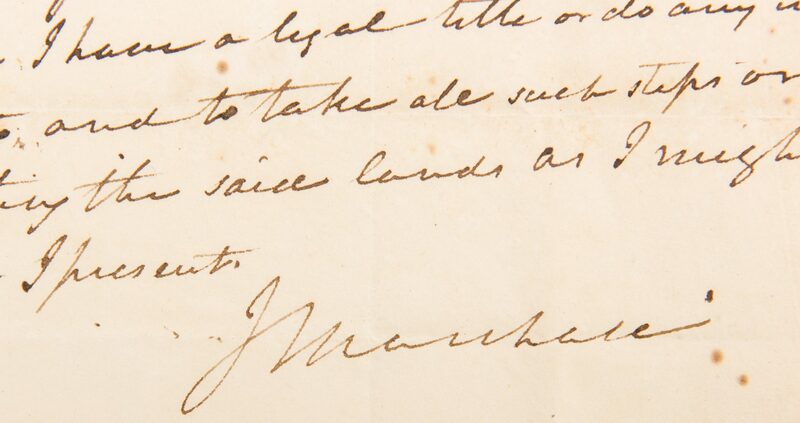 An autograph letter signed "J Marshall" as Chief Justice to his son James Keith Marshall. 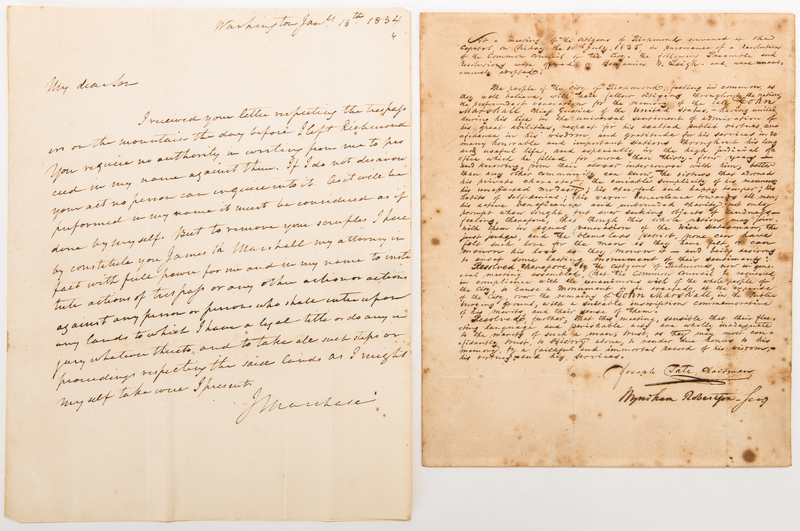 The great jurist wrote an intriguing legal letter that states in part: "I received your letter respecting the trespass on the mountain the day before I left Richmond. You require no authority in writing from me to proceed in my name against them. If I do not disavow your act no person can inquire into it. As it will be performed in my name it must be considered as if done by myself. But to remove your scruples I hereby constitute you James K. Marshall my attorney in fact with full power for me and in my name to institute actions of trespass or any other action or actions against any person or persons who shall enter upon any lands to which I have a legal title–". 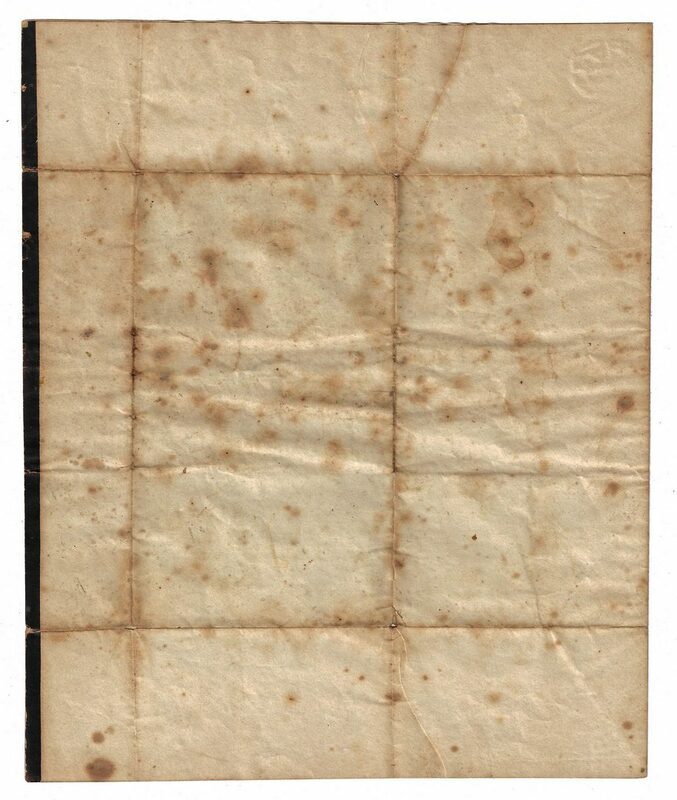 The address leaf, completed by Marshall, is included; the letter has mailing folds and is in fine condition. 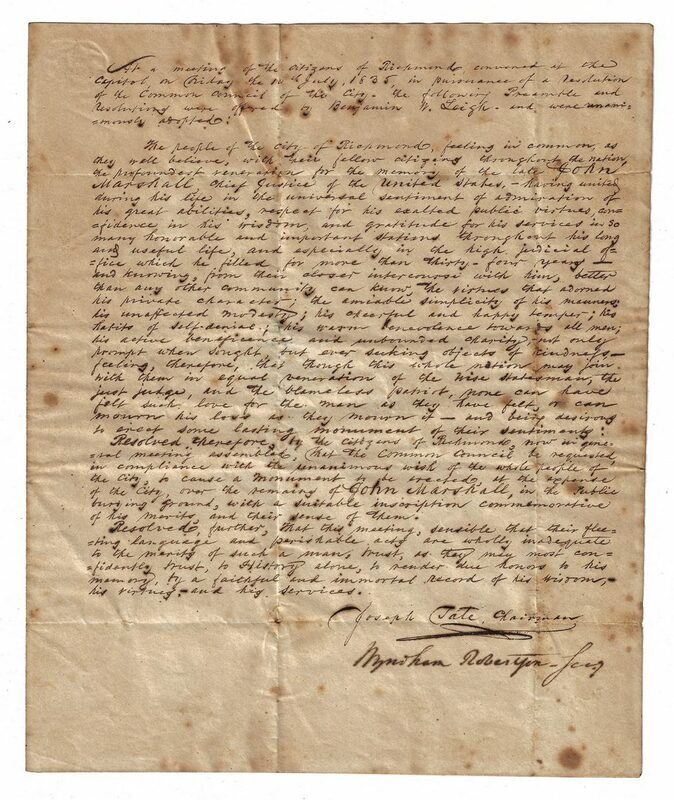 2nd item: Autograph document signed "Joseph Tate Chairman" written just four days after Marshall's death. It is dated July 10, 1835 from Richmond and it summarizes statements made by Benjamin W. Leigh, a prominent citizen and fellow member of the Buchanan Spring Quoits Club, to the city council and citizens of Richmond, Virginia in regards to commissioning a monument in the memory of the late Chief Justice Marshall. Includes a black wooden frame with Edwards Art Store, Chattanooga, TN stamp en verso. 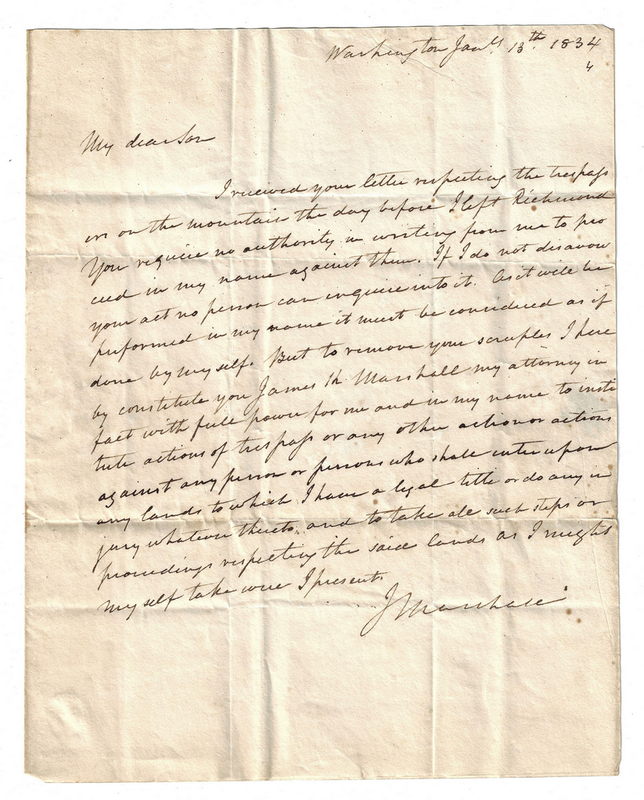 Letter – 8 7/8" H x 7 1/2" W. Framed – 9 3/4" H x 8 1/4" W. Note: "Marshall was a member of the Buchanan Spring Quoits Club (also known as the Richmond or Fairfield Sociable Club), which consisted of 30 elected members, including the city's leading merchants, politicians and professional men such as John Wickham, William Wirt, Benjamin Watkins Leigh, John Buchanan, and John D. Blair. The group met every Saturday afternoon from May to November at Reverend John Buchanan'­s farm and the men were no strangers to having a good time. They feasted on barbecued pig and drank punch and juleps. Talking about politics was strictly prohibited at these gatherings. Rule breakers were punished by Marshall with a hefty fine – alcohol". (Source: http://preservationvirginia.blogspot.com/search?q=John+Marshall and http://www.lva.virginia.gov/exhibits/marshall/). 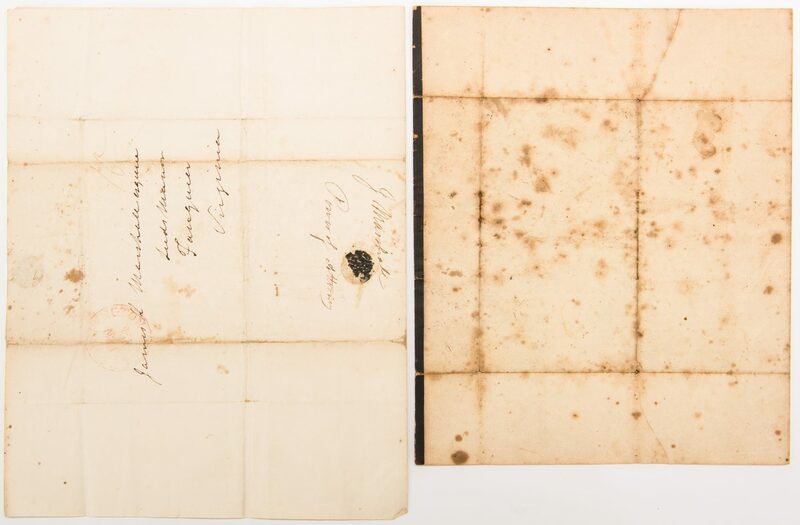 Provenance: The Estate of Charles Boyd Coleman, Jr., Chattanooga, TN, by descent from Lewis Minor Coleman, Jr., son of CSA Lt. Colonel Lewis M. Coleman and Mary Ambler Marshall, daughter of James K. Marshall and granddaughter of John Marshall (1755-1835). Lewis M. Coleman Jr. was also related to the family of General Henry Dearborn by his marriage to Julia Wingate Boyd, daughter of Annette Maria Dearborn Boyd, who was the daughter of Greenleaf Dearborn (1786-1846) and great granddaughter of Henry Dearborn (1751-1829) on her mother's side. Description courtesy of Stuart Lutz Historic Documents, Inc. CONDITION: 1st item: Overall very good condition with fold lines, some toning and foxing spots, to be expected from age (see description). 2nd item: Overall good condition with toning and foxing spots, largest 1", to be expected from age.